The process of creating a rare diamond starts at the mining and sorting level, where diamond miners must sift through millions of tons of earth to source small pebbles of diamond rough. Large mining concerns like De Beers, Rio Tinto and BHP Billiton along with smaller companies like Petra diamonds mine diamond rough from all over the world and offer it for sale at their diamond tenders for manufacturers to bid on. 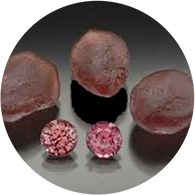 AIDC Advantage is a specialist in acquiring, analyzing and polishing colored diamond rough to ensure that the best color and largest weight in the best made stone possible is attained from any given piece of diamond rough sourced from diamond mines around the world. From our courses on analyzing diamond rough to our rough diamond tenders, we source goods directly to ensure our clients have the most competitive pricing levels within the best quality standards.